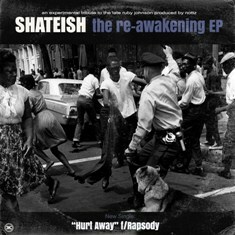 Singer Shateish partnered with Rapsody on “Hurt Away,” a funky introduction to her The Re-Awakening EP. Shateish worked with accomplished hip-hop producer Nottz on the project, who marveled at the Portsmouth, Virginia singer’s “old school” voice. “We need more of that,” he has said about Shateish. The duo worked together to deliver just that on the EP, typified by the funky, bluesy “Hurt Away.” Nottz hooked up soaring horns for Shateish to belt out stirring lyrics about longing to drag someone out of the doldrums through sheer love. “Somebody took away that warm glow that used to be in your eyes,” Shateish regrets on the track that’s a throwback to the 60s but still stays modern through the polished mixing and crisp drums.